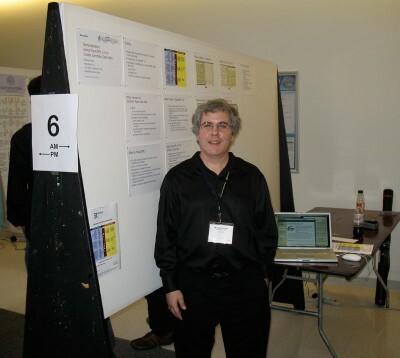 Last week’s ISMIR 2008 conference on music information retrieval was another grand success. It was great to meet several people who I had only corresponded with before on the MusicXML developer mailing list, including Geoff Chirgwin, Joachim Ganseman, and Phil Kirlin. There was plenty to catch up on with friends and colleagues, and meeting new people doing all sorts of interesting things. Using XQuery on MusicXML Databases for Musicological Analysis by Joachim Ganseman, Paul Scheunders and Wim D’haes introduced XQuery to the ISMIR community. Ian Knopke presented a paper on his work in rewriting much of the Humdrum toolkit in Perl: The Perlhumdrum and Perllilypond Toolkits for Symbolic Music Information Retrieval. But these tools can also read MusicXML files, opening the door to doing Humdrum-like analyses directly on MusicXML data. MusicXML is the input format for A Framework for Automated Schenkerian Analysis by Phillip Kirlin and Paul Utgoff. MusicXML was used as the symbolic format for scanned sheet music in Automatic Mapping of Scanned Sheet Music to Audio Recordings by Christian Fremerey, Meinard Mueller, Frank Kurth and Michael Clausen. The CrestMuse project is using MusicXML in many interesting ways. For instance, MusicXML is the score format for A New Music Database Describing Deviation Information of Performance Expressions by Mitsuyo Hashida, Toshie Matsui and Haruhiro Katayose. Joe Berkovitz presented a demo of Noteflight: An Online Browser-based Editor for Music Notation. MusicXML support is in the works. MusicXML was included in the metadata evaluation paper Connecting the Dots: Music Metadata Generation, Schemas and Applications by Nik Corthaut, Sten Govaerts, Katrien Verbert and Erik Duval. Many different formats were compared from the perspective of being metadata for audio files. MusicXML was used as a symbolic format for melody analysis in Melody Expectation Method Based on GTTM and TPS by Masatoshi Hamanaka, Keiji Hirata and Satoshi Tojo. This entry was posted in MusicXML, Software, Travel. Bookmark the permalink.